To start the new year in the right way, we are giving away a fantastic Roughneck non-slip, anti-shock hammer and set of tough chisles and punches. Roughneck (as the name suggests) are renouned for their solid, tough, durable tools and these two are no exception. The hammer features a no shock, non-slip, gel filled handle to help prevent wear and tear on yourself, whilst also featuring a square head allowing you to nail right up to any edges. A unique addition to this hammer is the magnetic nail holder that allows one handed operation! Like the hammer, the chisels are also similarly tough and hardwearing. 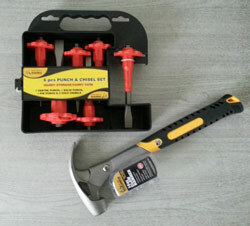 The set comprises of centre punch, pin punch and a range of cold chisels that also have protective hand guards. What an incredible way to kick off the new years resolutions by getting all those jobs done round the house! Simply enter your details and answer the question to ensure you are in with a chance of winning – this competition is open to anyone over 18; there is no purchase necessary. Please see the full T&C’s here. The winner will be selected at random. The competition will close at midday on Thursday 4th February 2016.